Poker Chip 831 closed out the wet trial night with the third fastest time in the final trial race. 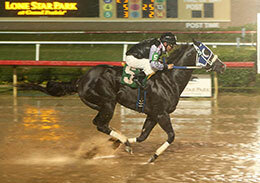 GRAND PRAIRIE, TX�OCTOBER 23, 2015�Poker Chip 831 splashed to the third fastest qualifying time for the $415,690 23rd running of the Texas Classic Derby(G1) Friday night at Lone Star Park after posting an impressive trial victory. The 10 fastest qualifiers, from the 44 three-year-olds who competed in five rain-drenched trial races, will return to the Grand Prairie, Texas racetrack on closing night, Saturday, November 14th and vie for the winner's share of the purse over a 440-yard course. Trainer Rubio Esteban saddled the lightly raced Poker Chip 831 to the third fastest time of :21.529 seconds, a 92-speed index. Damian Martinez rode the gelding by first crop sire FANTASTIC CORONA JR to a two-length win into a rainy 4 mph headwind for owners Katsy and Monte Cluck. It was only the fifth career start, and third win, for the Texas-bred gelding out of Takeoff Royally, by First Down Dash. Burnett Ranches, LLC bred the colt who broke his maiden in his first start, a trial for Rainbow Futurity at Ruidoso Downs, and won his trial to the Grade 1 Texas Classic Futurity a year-ago at Lone Star Park. The Clucks are co-owners of all-time leading money earner Ochoa. For the complete list of Texas Classic Derby finalists, times, sires, dams, owners, breeders, trainers and jockeys CLICK HERE. Reminder tomorrow, Saturday October 24 Lone Star Park will have an early first race post time of 5:05 p.m. to accommodate 16 trial races that will decide the field for the $1 Million Grade 1 Texas Classic Futurity. Gates open early at 4:00 p.m.